The Palestinians continue to lament May 15 1948 as the Nakba, or Catastrophe, when they were ethnically cleansed from their villages by Jewish terrorist groups: the Haganah (one of the forerunners of the IDF), the Irgun and Lehi (also known as the Stern gang). Some may say that the latest clashes in Gaza are just part of the same old scenario which has been going on for exactly 70 years. Not quite. The seventieth anniversary of the Naqba or Catastrophe “coincided” with a glitzy ceremony to open the US Embassy in Jerusalem. This was not mere symbolism. The US was not always so one-sidedly pro-Israel but, as the embassy move shows, it has dropped all pretence of looking for the chimera of a “fair” solution to the Palestine-Israel conflict. Instead the US has identified even more closely with Israel as part of its policy of thwarting the imperialist ambitions of Iran in the area. The Palestinians are once again on the wrong end of imperialist policy – a factor which explains their predicament ever since the foundation of the state of Israel exactly 70 years ago. Brutal though the massacres of Palestinians were in 1948, it was not terrorism alone which brought about the state of Israel. It was a unique conjunctural moment in the history of imperialism. After 6 years of the most brutal war in human history – the kind of war of annihilation that only a capitalist system in its imperialist phase could bring – the victors could look around at a half-destroyed Europe and a devastated Japan to impose whatever order on the world they liked. However by 1947 the Cold War between the two super-powers had begun. The USSR and the United States both supported the creation of the state of Israel because they both thought it might be useful for their strategic interests and they both did not want the other to be its sole sponsor. Although nominally amongst those victorious powers, the United Kingdom of Great Britain and Ireland, as it was known from 1947, was actually one of the losers of the two great imperialist wars of the Twentieth Century. Churchill had not championed the fight against Hitler because he was “a monster” who murdered an estimated 13 million people (including 6 million Jews) in the death camps. Rather, he was leading the fight to defend “the British Empire and its Commonwealth” which, in his view, and not unlike the Third Reich, also had aspirations to “last for 1000 years”. Unfortunately for an almost bankrupt British imperialism the Second World War just finished off what the First World War had started. Both wars destroyed much of Britain’s previous financial control of places like Latin America and it simply did not have the strength to hang on in much of its Empire. A partitioned India (the former “Jewel in the Crown”) was quickly abandoned to ethnic cleansing and massacres whilst the USA had to be called in to stop the Greek Communists (the Stalinist KKE) winning victory in the civil war against the pro-British monarchists there. In Palestine though, the weakness of British imperialism was compounded by its earlier imperialist policies. In the First World War the British had promised the Arabs that they would enjoy independence if they helped in the fight against the Ottomans. The Arabs were not to know (at least not until the Bolsheviks published all the secret treaties of the Entente powers after October 1917) that the French and British had already planned (1915) to partition the Middle East in their own favour. In the Peace of Paris the British received Palestine, Iraq and Jordan as “mandates” from the League of Nations. … Zionism, be it right or be it wrong, good or bad, is rooted in age-long tradition, in present needs, in future hopes, of far profounder import than the desires and prejudices of the 700,000 Arabs who now inhabit that ancient land. He was uninterested in the fact that these same Arab people had been there for roughly the same length of time as the Anglo-Saxons had been in England! Even Chaim Weizmann (the Zionist leader and future first President of Israel), who went to Palestine to establish a Zionist mission, left after a short while, convinced that the place was too Arab to become the basis for a future Jewish state. In fact, only 3% of the population of Palestine was then Jewish but the Balfour Declaration gave an enormous boost to Zionism (which had been opposed by many, perhaps a majority, of Jews until then). The British appointed the leading Zionist Herbert Samuel to run Palestine after the war. Samuel had proposed to the British Cabinet as early as 1914 that a Jewish state in Palestine would be in British interests and he lost no time in promoting Jewish immigration. By 1935 Jews accounted for 16% of the population. Whilst Zionism had grown alongside (and in some ways as a response to) the rise of nationalism in Europe,  Arab (and indeed Middle Eastern) nationalism was not well developed. Cash-strapped absentee Arab landlords were only too glad to sell parcels of land to Jewish settlers who received substantial financial support from the Jewish Agency and its world-wide backers. On the other side there was no unity amongst the various traditional leaders of the Arabs. Local dynasties like the Hashemites were more concerned about controlling their own territory and some, like Amir Abdullah, became a British stooge in the supposedly independent state of Transjordan set up in 1923. It was only in 1935 that the Arab leaders were united enough to demand an end to Jewish immigration and when they learned that the Zionist settlers were smuggling in arms the Arab Revolt broke out. It began with a six months general strike and lasted 3 years but it failed utterly. Not only did it give some Zionists the experience of fighting the Arabs (in concert with the British Army) it also provoked the British Government to come up with a plan for partition of Palestine for the first time. The Peel Commission not only proposed this but also the expulsion of some Arabs from their land to make way for a Zionist state. The imminence of the Second World War, however, led to a change in British policy. Counting on the loyalty of the Jewish community against the Nazis they sought to placate the Arabs by limiting Jewish immigration and offering an independent Palestinian state within ten years. Since Arabs would still be in a majority, the Zionists regarded it as a betrayal of the Balfour Declaration. The Arabs, led by the party of the Mufti of Jerusalem, also rejected it because they (understandably) no longer believed in the promises made by British imperialism. This led the Mufti to throw his support behind Nazi Germany – a fatal step which ensured that the Arabs of Palestine were totally isolated in the post-war imperialist carve-up. In rejecting the British plan the Zionist movement turned to outright terrorism, being the first to introduce the bombing of innocent civilians in Arab markets which has been much imitated since by all kinds of terrorist organisations. It peaked with the blowing up of the King David Hotel in July 1946, killing 91 British soldiers and civilians. A few months later an enfeebled British imperialism handed the problem it had largely created over to the United Nations. After World War One the League of Nations had held plebiscites to determine the future status of many areas. Some of these were rigged (such as that in Silesia where Poland was given a chunk of this industrial area which had voted to remain German) but the United Nations had no such intentions. It decided on partition without consulting the local inhabitants. The partition plan gave the Zionists 55% of the territory of Palestine (when in fact it held only 8%). What pushed the plan through was that both the USA and USSR brought enormous pressure to bear on the UN members to vote for the scheme. Ironically, in view of later developments, it was the USSR which was most enthusiastic about the formation of the state of Israel. They not only thought it an “anti-imperialist movement” which would doom the British Empire but also saw it as the shape of things to come. Stalin even relaxed his usual anti-Semitic policies as he sought to win over the Zionists. However, in March 1948 the US came out against forcible partition of Palestine. By this time the British were in full retreat and communal fighting had broken out between Jews and Arabs. An Arab Liberation Army of some 3000 volunteers tried to defend the local Arab community but they were outnumbered and outgunned by various Zionist terrorist organisations. Worried about the US’ position, the Irgun and Stern gang were collaborating with the Haganah to implement Plan Dalet which aimed to seize most of Palestine. The strategy was consciously based on the massacre of enough Palestinians to force the rest to flee. The Irgun massacred 250 Palestinians in the village of Deir Yassin, whilst there were many other such massacres in Lydda and elsewhere. As Yitzhak Rabin [later Prime Minister and Nobel Peace prize winner before his assassination by a Zionist extremist in 1995 for signing the Oslo Accords] noted in his memoirs, this ethnic cleansing produced the not entirely miraculous outcome of hundreds of thousands fleeing in advance of the Zionist forces so that half of the population ended up in neighbouring Arab lands. The British had already left on 14 May and the state of Israel was proclaimed the next day, receiving de facto recognition from both the competing imperialisms of the USSR and USA within hours. A year later, Israel was rewarded for its ethnic cleansing by being admitted to the United Nations. Thus the Palestinian Catastrophe (Naqba), and the formation of the State of Israel were products of all the machinations of the world imperialist order of the twentieth century. The Israeli state could also count on the financial support of world of the United States and West Germany (the latter in the form of guilt money for the Holocaust termed “war reparations” after a treaty signed in 1953) and pro-Zionist supporters across the world. This enabled the Israeli state to develop its economy and its armed forces. Within a few years 700,000 Jews from across the world had migrated to Israel to begin redressing the population balance in their favour. The establishment of Israel, however, also gave a boost to the transformation of Arab nationalism from the cult of a few intellectuals or the manipulations of “traditional leaders” like the Hashemite monarchs in Jordan and Iraq who had sold themselves to Western imperialism. When army officers headed by Neguib and Nasser overthrew King Farouk, the British puppet in Egypt in 1952, it was to rid the state of his incompetence and corruption. The US at first was sympathetic to their movement and was very conscious of the possibility that the USSR might muscle its way into the Arab world. Thus, when Nasser nationalised the Suez Canal the British, French and Israeli governments agreed on the invasion of Egypt. This infuriated the Eisenhower government which saw this as something that would drive the Arabs into Russian arms. In a clear sign of who ran the so-called “free world” the US forced the three allies to halt their operation in Egypt and back down in November 1956. The US was right to be fearful of the gains of the Soviet Union. Within a few years they were supplying arms to Egypt, Syria and Iraq and only an invasion of Lebanon (up until then known as the “Switzerland of the East”) in 1958 prevented the US losing control there. The Egyptians reneged on plans for the US to build the Aswan High Dam and the Soviet Union stepped in to take on the project (thus turning Egypt into its client state for the next 15 years). In the 45 years since the Yom Kippur War and despite Camp David Agreements and Oslo Accords it is clear that the Israeli ruling class has no intention of ever handing back the territory it occupied in 1967. The repeated settlement programmes and the wall in the West Bank testify to its intention to prevent the establishment of a Palestinian state. In this they have been encouraged by one US administration after another, which – despite occasional mild criticisms of Israel – has always used the veto to block any UN Security Council resolution which would have made Israeli control of the occupied territories just a little more uncomfortable. 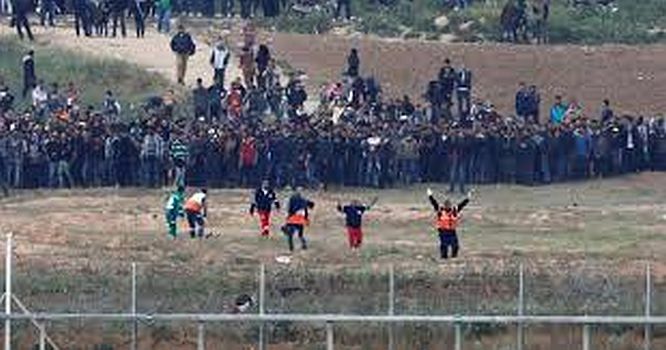 In the latest Gaza shootings of unarmed civilians the new US secretary of state Mike Pompeo opined that “the United States is with Israel in this fight, and we strongly support Israel’s sovereign right to defend itself”. At the same time, his UN Ambassador, Nikki Haley vetoed a Security Council resolution that would have simply investigated the Gaza shootings arguing that “no-one has shown more restraint than the Israeli Government”. In the past US administrations would have been more measured, calling for restraint rather than encouraging violence. At the same time though, they continued to pump $3 billion a year into Israel (three quarters of which must be spent on US military supplies). With this US administration the mask is off. There will be no “solution” to the Palestinian question other than the complete subjugation of the Palestinians. Today the biggest threat to the existence of that “rampart” comes from Iran which, largely thanks to a series of US miscalculations born of hubris (like the invasion of Iraq), has increased Iranian power in Syria and Iraq, thus creating a corridor to reach their staunch supporters, Hezbollah, in Lebanon. It is no casual whim that has led to the US pulling out of the Iran nuclear agreement. The real issue is the advance of Iranian power in the Middle East. The nuclear deal did not deal with that, which is why most US sanctions against Iran still stand. Ironically if anyone could call it a “bad deal” it was not the US but the Iranian ruling elite who got little economic benefit for ending their nuclear programme. The signs were that the working class in Iran had not only had enough of the dire economic conditions (wages not paid for months etc), but also the waste of money in imperialist adventures around the Middle East which could have been spent on the economy at home. It seems that Trump abandoned Obama’s policy just when it was beginning to work! European powers may have been more inclined to trade with Iran than the US, but European companies such as Total, who prepared to invest in Iran, were less sure since they could be fined in the US if they broke US sanctions. Netanyahu, in his recent tour of Europe to push the case against Iran, was thus able to tell Macron, with a smug smile on his face, that the Europeans could try to keep the nuclear deal alive but it will die due to “the weight of economic forces”. This is not quite true since US sanctions are not mere “economic forces” but a political interference using American economic muscle. The picture is clear. The US is in a position to use its legal system to retaliate against any except the smallest of European companies doing business with Tehran. Even more clearly, the anti-Iranian alliance also incorporates Iran’s long term rival in the Middle East: Saudi Arabia. Saudi Crown Prince Mohammed bin Salman met Jewish leaders in New York in late March. At this meeting he accused the Palestinian leadership of repeatedly missing all the opportunities presented to it for the past 40 years and rejecting all the proposals it had received. With regard to the Palestinians, he made it clear that the issue was not a priority for his government and for the Saudi public. Palestinians “should accept the deal on offer” and “stop complaining”. He concluded that “there are far more pressing and more important issues to deal with, such as Iran…”. So once again the Palestinians have become collateral damage in inter-imperialist conflict. The increasing intransigence of the Israeli state, which now has a cabinet dominated by ministers like Lieberman and Bennett who have no intention of evacuating a shred of Eretz Israel and are prepared to kill every Palestinian who opposes the occupations,  now has unequivocal international backing from the US. It is the final confirmation that the Israeli state has no real independent national existence but exists only thanks to a world imperialist order dominated by the United States in which, in the latest twist in US foreign policy, it is destined to play a major role. The second error of the supporters of the Palestinian national cause is in the phrase “the anti-imperialist struggle”. There is only one “anti-imperialist struggle” today and that is the struggle of the world working class to throw off the shackles of the system that has produced imperialism – capitalism. The question is not nations but classes. As Marx wrote in the Communist Manifesto “Workers have no country. You cannot take from them what they have not got”. The people who want workers to fight or die for this or that “country” are the bourgeoisie who own it. And this applies everywhere. There is a fake argument amongst the so-called left that fighting for this or that national cause that yes, it may bring the bourgeoisie of that nation to power, but then the class struggle can really start. Apart from the question of why workers would spill their blood for a cause which favoured the bourgeoisie, such national struggles hand over the political programme to the propertied owning classes. They are the nation incarnate and they will use the very liberation struggle to justify their power. A glance at what happened in South Africa, Zimbabwe and every other “post-liberation society” is enough to confirm that. A working class struggle of a sort exists there but it is difficult for it to develop independently given the wave of nationalism which brought the bourgeoisie there to power. Today Cyril Ramaphosa, once the anti-apartheid leader, the founder of the National Union of Mineworkers (NUM) and leader of the 1987 miners’ strike, after so-called “liberation” quit the NUM and became a board member of LONMIN the platinum mining house. During the strike at LONMIN’s Marikana mine in 2012 he was instrumental in getting the strike classed as “criminal” rather than economic which led to the police massacring 34 striking miners. Today he is a multi-millionaire and, of course, President of South Africa whilst nothing has changed for the majority in South Africa. Today in Palestine neither a one-state nor a two-state solution to the national aspirations are possible (without the destruction of Israel which is not likely to happen). The only solution for the Palestinian proletariat is the no-state solution – the abolition of all capitalist states and their brutal imperialist rule. The Palestinian workers, hemmed in by Hamas (who would kill any worker advocating what we are advocating here), have little chance of developing that autonomous struggle alone – they can only do so as part of the world proletariat in the only real anti-imperialist struggle – the destruction of the capitalist world order. This is also dealt with in more detail in the article on Oil and the Shifting Sands of Imperialism (see above note). in “Two Terrorisms” London _Review of Books_ 24 May 2018. Siegman who was brought up in a “deeply Zionist and religiously observant home” is professor emeritus of the US/Middle East Project and a former senior fellow of the Council on Foreign Relations. Quoted in M. Rodinson Israel _and the Arabs_ p. 14. This will be the subject of a more detailed analysis of imperialism today in the forthcoming Revolutionary Perspectives 12. In an Israeli cabinet meeting, Naftali Bennett, leader of Habayit Hayehudi (The Jewish Home) stated “if you catch terrorists you simply have to kill them”. When it was pointed out that this was illegal he replied “I have killed lots of Arabs in my life and there is no problem with that”. Quoted in Siegman (see footnote 4 above). “The Palestinian Proletariat is Spilling its Blood for a Bourgeois State” Translated from Prometeo Series VI No 1 December 2000 and published in English in Revolutionary Perspectives Series 3 No 20 (Winter 2001).